The content of this article provides interesting history, facts and information about Colosseum Entrances and Exits. The famous amphitheatre was designed to take a capacity of between 50,000 and 80,000 spectators. It was imperative to ensure that the massive crowds who flocked to the Colosseum were seated quickly and efficiently. The design of the great Flavian Amphitheatre took this major requirement into account. It should also be remembered that fabulous and exotic wild animals such as mighty elephants and tall giraffes also had to be easily ushered into the great amphitheatre. 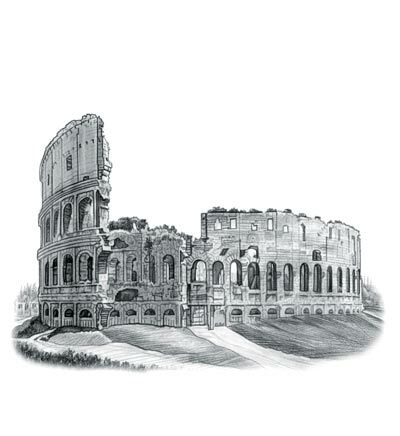 The size and number of the Colosseum entrances and exits were of great importance. The oval shaped Colosseum is 47 m (157 ft) high and is a three-storied arcade surmounted by a fourth story pierced with window-like openings. Each of the three tiered stories originally had 80 arches - the columns were on the first level were of the Doric design, the second Ionic and the third Corinthian. The Colosseum amphitheatre was therefore ringed by eighty entrance gates at ground level which formed the entrances and exits for the spectators. There were 76 entrance gate arches, which were used by the general public, plus four special un-numbered gates which were the Grand Entrances. The public entrances were numbered providing easy access to the allocated seats. The walls leading from the numbered entrances to the seats were plastered and painted white and red. The special, un-numbered gates, were used by the emperors, wealthy patricians, senators, visiting dignitaries and the Vestal Virgins. The walls leading from these entrances were decorated with paintings and stuccoes. The entrance arches gave admission to a corridor, running uninterruptedly around the building leading to staircases and passages to the seats. The passages were called the vomitorium (plural: vomitoria) and these were situated below or behind the tiers of seats in the amphitheatre through which the crowds could "spew out" at the end of a performance. The four special un-numbered gates were located at points North, South, East and West of the Colosseum. At the long axis ends of the arena were two entrances which were west and east of the arena - see above plan. All of the four axial entrances were richly decorated with painted stucco reliefs of which fragments still survive. The content of this Colosseum Entrances and Exits category on life in Ancient Rome provides free educational details, facts and information for reference and research for schools, colleges and homework. Refer to the Colosseum Sitemap for a comprehensive search on interesting different categories containing the history, facts and information about Ancient Rome. Just like the subject of Colosseum Entrances and Exits there is hardly a page of Roman history and the Romans that is not, on some way, connected to the Roman Colosseum which became a symbol of Rome, its society, culture and life.